Home The Economy Oil Repent! Repent! Grid Parity is Nigh! Repent! Repent! Grid Parity is Nigh! For as long as I can remember, I’ve been hearing dire warnings that unless Venezuela got its act together, it could just plain miss the short critical window of opportunity for monetizing its vast oil resources. “Other” technologies would inevitably catch up and make oil as irrelevant to the future as Whale Blubber was to our present. There was always something a little vague about the warnings. A fog over the question of which technology would “do in” oil. It was easy to come away with the sense that while theoretically true this was all a long, long way in the future. No more. As of QIII, 2015, I’m ready to call it. In the library. With the candlestick. This report from Deutsche Bank should scare the hell out of anyone sitting on top of an unexploited energy resource. It shows that “Grid Parity” – that mythical, long hypothesized magic moment when it becomes cheaper to produce electricity from a solar panel on your rooftop than to buy it from your utility company – isn’t just some exotic projection. And not just small markets, either. 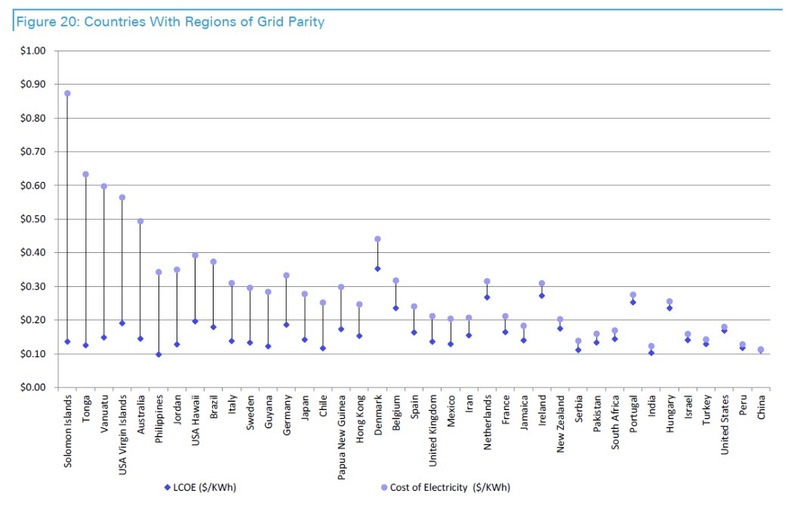 Parts of the U.S., Japan, China, Germany, the UK and France are already at Grid Parity. Those are the six biggest economies in the world! And the trend is set to become entrenched, fast. By 2017 – just two years from now – 80% of global electricity market will be at Grid Parity. And Deutsche Bank is keen to point out how new financing vehicles for Photovoltaics like the suddenly trendy “YieldCos” (sort of REITs for your Solar Panel) are closing the last remaining barriers for mass solad adoption. The one-two punch of Grid Parity and standardized YieldCos will herald an enormous acceleration in solar adoption rates. We’re already on that exponential bandwagon, but the ride is only now starting. It’s true – and DB stresses – that the oil and electricity markets remain pretty strongly segregated. Coal and Natural Gas, along with Nuclear and Hydro, remain by far the dominant sources of electric power worldwide, with Diesel far too costly to compete in most markets. But with new battery storage technologies coming hot on the heels of improving Photovoltaic performance, with “Solar and Storage” becoming the Next Big Thing, and with Elon Musk waxing rhapsodic about his damn batteries, oil’s trump card as a transportation fuel may not last very long either. If you’re worried about Climate Change – and you should be – this is all undoubtedly good news: the chances have never been better that large chunks of proven fossil fuel reserves will just be left underground, because it’s unprofitable to pump them out and burn ’em. But if you’re banking on energy resources pulling you out of the godforsaken mess some tinpot pseudosocialist autocracy has left you in, this is pretty damn dire news. Because what the advent of mass solar generation and storage will do is put a cap on the potential price of oil: a level above which it cannot go without sending mass defections to an alternative, proven, established technology. And that price is only going to go down, decade after decade, until oil-based fuels become a niche product used only in specialist applications where its energy-to-weight ratio really makes the difference. So, basically, aviation and…nope, that’s it, aviation. By 2025, Venezuela may find that it sits atop more extremely-impure JetFuel than it can ever possibly hope to sell. ¡Que Dios nos agarre confesados!